AMID THREATS by part of the national leadership to split away, last weekend's national congress of the WASG* (Election Alternative for Work and Social Justice) agreed to unify with the Linkspartei.PDS (L.PDS, Left Party/PDS - the former East German 'Communists') and to take measures against the Berlin WASG if it went, writes Robert Bechert, CWI, Berlin. THOUSANDS OF students across the US 'Twin Cities' [Minneapolis and St Paul] walked out of class on 28 April to protest against the occupation of Iraq and military recruitment in schools, and demanding money for education and social needs, not war, writes By Socialist Alternative members. 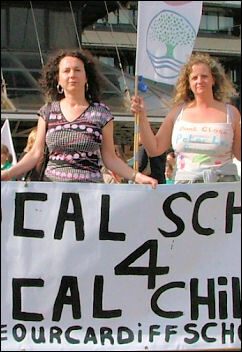 LSC staff say "enough is enough"
"WHEN WILL Mark Haysom stop running the LSC as a PLC - before or after his knighthood?" This was typical of the comments from the Sheffield picket line about the chief executive of the Learning and Skills Council (LSC) last Friday, 28 April, writes Marion Lloyd, PCS national executive committee. Press release Socialist Party members – standing as Socialist Alternative candidates and on behalf of Save Huddersfield’s NHS campaign - scored outstanding successes in the local elections. OVER 1,000 parents and school students turned up to lobby Cardiff Liberal council last week as the council intended to close 22 schools and threaten 300 teaching jobs across the city. The school students travelled to the demo in specially hired open buses, accompanied by brass bands and the like. LECTURERS IN the NATFHE and AUT unions are engaged in a marking boycott at universities across the country. They are struggling for the wage increase that university vice-chancellors said was the main reason for charging students, writes Iain Dalton, Huddersfield Socialist Students. THE COMMUNICATION Workers' Union (CWU) Postal national executive committee has just overwhelmingly rejected what was termed as Royal Mail's full and final offer and which Royal Mail called "excellent" and "inflation-busting", writes Gary Clark, vice-chair, CWU Scotland No 2 branch. In recent months political and social activists in Germany have been gripped by the widely publicised open debate in the WASG (Election Alternative for Work and Social Justice, the anti-neo-liberal party that developed in 2004), writes Robert Bechert, cwi, Berlin, Germany. "THE MOST dangerous man in the region" is US secretary of state Condoleezza Rice's description of Hugo Chávez, Venezuela's president who is visiting London this week, writes Karl Debbaut. Local elections: A death blow for Blair? Huddersfield: voters choose a socialist and a fighter! Socialist policies needed to resist war, cuts and capitalism: ON 6 May, in Athens, up to 100,000 Greek workers and young people including around 9,000 political activisists from the rest of Europe marched against war and capitalist exploitation, writes Andros, Xekinima (CWI, Greece). IN AN unprecedented but not unexpected act, the national executive of Germany's new left party, WASG (Election alternative - work and social justice), suspended the regional executives in the federal states of Berlin and Mecklenburg Vorpommern, writes Tanja Niemeier, Committee for a Workers' International. AUT conference: FROM 10-12 May, higher education union AUT held its last annual council (conference) before its merger with NATFHE to form the University and College Union, UCU, writes Thomas House. COMMUNICATIONS COMPANY NTL have announced over 1,500 job losses. They recently merged with Telewest after both companies ended up in financial difficulties. This highlights the need for a democratically controlled public, writes Bernard Roome, CWU NEC, personal capacity. AS THE CWU national conference begins, the Communication Workers' Union (CWU) national executive committee has called an industrial action ballot of its postal members against the 2.9% pay rise imposed by Royal Mail, writes Gary Clark, vice-chair, CWU Scotland No 2 Branch. THE RAIL network across the whole of Britain looks to be heading for a long hot summer of discontent. The four rail unions, RMT, TSSA, ASLEF and the CSEU have joined forces in an attempt to safeguard their members' pensions, writes Gordon Martin, branch secretary Wishaw and Motherwell RMT, personal capacity. A TWO-month campaign led by students and lecturers has checkmated the University of Sussex's senior management's plan to close down its Chemistry department, writes Richard Mullin Socialist Students, Sussex. Chávez in London: VISITS BY presidents to other countries are usually met with protests or indifference, but the visit by Hugo Chávez to London on Sunday was met by hundreds of people ready to welcome him to the city and eager to listen to what he had to say, writes Denise Dudley. Socialist Party National Committee report: FRANCE, GERMANY, Italy... no not the World Cup finals but Europe in revolt against neo-liberal policies - this was the inspiring final discussion at the Socialist Party (SP) national committee meeting on 13-15 May, writes Alistair Tice, Sheffield. A party for the millions - not the millionaires: AFTER THEIR disastrous showing on 4 May, New Labour now has fewer councillors than at any time since 1973. Tony Blair is clinging to power by a thread - as Labour MPs and councillors realise that their own careers are, writes Hannah Sell, Socialist Party executive committee and assistant secretary CNWP. WHIPPS CROSS hospital Trust in east London recently declared a £24 million deficit. 400 jobs are already under threat as are some elderly care beds. The Trust are cutting overtime and agency staff but 50 compulsory redundancies are predicted. BECAUSE OF New Labour's attacks on the NHS, hospital Trusts are threatening to sack health workers, cut beds and close down wards. 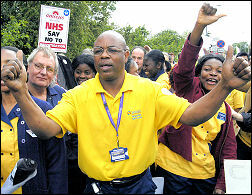 Around 13,000 jobs have already been placed at risk, including 1,000 at the NHS Direct helpline. 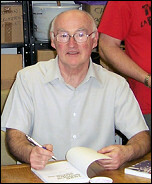 Jon Dale, Bolsover Socialist Party writes. NATFHE MEETS this weekend for its final conference. This follows the decision of members of both NATFHE and the AUT to merge into what will be the largest post-school education union in the world - UCU the University and College, writes Andrew Price (NATFHE NEC member Further Education Wales). A FIFTEEN year old Catholic school student, Michael McIlveen, was brutally assaulted in a sectarian attack in Ballymena, County Antrim on 7 May, writes Ciaran Mulholland, Belfast. MOST TEACHERS want to fight this Education Bill but unfortunately some of our union leaders are against discussing industrial action to oppose it, writes Martin Powell-Davies, Lewisham National Union of Teachers (NUT). 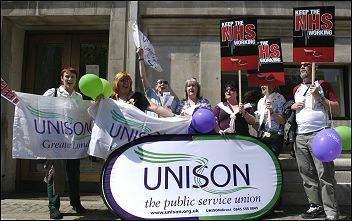 Wiltshire NHS: FOLLOWING ON from major cut-backs last year, Kennet/West Wiltshire Primary Care Trust (PCT) have announced the future closures of community hospitals in Trowbridge, Warminster, Devizes and probably Melksham and Marlborough, writes Roger Davey Senior UNISON steward, Swindon & Wiltshire Health Branch (personal capacity). Stand up to NHS cuts! 15,000 NHS job cuts have been announced in England and Wales since February this year! Every week the jobs cull gets bigger - but these cuts are not going unanswered. Local campaigns are springing up in many areas to fight to save the NHS. South West Trains: TWO HUNDRED train drivers, members of ASLEF based at Waterloo station in London, were on strike on 30 May. This was the first of a series of one-day strikes over the removal of tax benefits in kind by their employer South West, writes Chris Newby. PCS conference: The record of a campaigning union: CIVIL SERVICE union PCS conference takes place from 5 June, with the Left Unity-led national executive (NEC) having increased its majority for the fourth year running, writes Mark Baker, PCS NEC, personal capacity. THE SCOTTISH Socialist Party (SSP) has been rocked by the release of an open letter by Tommy Sheridan to SSP members which accuses "an unsavoury cabal of comrades at the core of the leadership who are more interested in pursuing personal vendettas, through vile lies and slander, than conducting the class struggle", writes Philip Stott, International Socialists, (CWI Scotland). BRAZIL'S HATED Military Police (PM) had a brutal response to the violence unleashed by the Primeiro Comando da Capital (PCC) in São Paulo on 12 May (see last week's the socialist), writes Tony Saunois, CWI, Brazil. WHILE ACTING Prime Minister John Prescott was amusing himself on the croquet pitch, the real thing was in Washington D.C. for talks with his partner in crime - the senior partner, that is -George Bush, writes Keith Pattenden. Can the Tories win the next election? 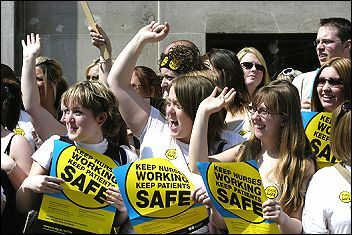 "We're seeing the Americanisation of the NHS"
Healthworkers say...: "LOW PAY no way." "They say cutback, we say fightback." 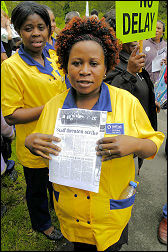 Hundreds of porters, cleaners and other hospital staff held a lively lunchtime protest outside Whipps Cross hospital in northeast London on 26 May. The hospital Trust is considering axing 400 jobs and closing four wards and two theatres. £15 million could be cut from primary care.